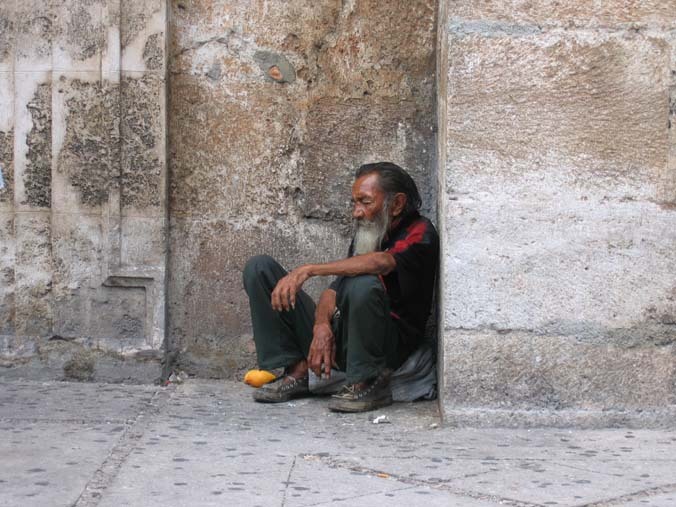 What does a homeless person signify to you? Sometimes it might signify someone who tries to take advantage of you, other times a person who ran out of luck. Sometimes nothing, as you pass him by, seeing him as just another piece of the background. I’ve had a lot of encounters with homeless people, of all sorts. I don’t make a habit out of giving them all money, only to those my intuition (or instinct, if you will) is telling me that they need it. And I do that especially with those who don’t ask. Today I was waiting in the bus station to take a bus to the city center (lately I enjoy taking the bus and the subway because I get the chance to observe people more, and I use the car only for longer trips) and I observed by my left side a homeless man sitting down on a concrete border in front of a drugstore. He was just sitting, not begging. Although he was dirty, hair unkempt, not shaved and wearing old and dirty clothes – he seemed dignified. He was in his 40s by the looks of it, 190-200 lbs., tall, and had only a plastic bottle with him, three quarters full of a cheap brand of orange juice. I observed him from the side for about 5 minutes. He looked like a normal human being who went through a lot, and by the wrinkles on his forehead you could see clear as day that he must have had a few stories to tell. All of a sudden I felt the need to sit beside him and chat for a while, but something stopped me. Furthermore, he started gesturing and talking to himself on a quiet voice, as if he didn’t want to bother the people next to him. I opened up my wallet, pulled out a few notes and gave them to him. He looked at me with his big eyes and nodded his head, a sign of gratitude, and immediately jumped on his feet and started walking away, like he was on a mission of some sort. He was probably going to the store to buy something. As he started gaining distance I caught a glimpse of him partially turning my way as he was still walking and, without looking directly at me he once again nodded his head, as if he was thanking me once more. This final gesture touched me and reminded me of another homeless guy whom I’ve met one night in the subway, as I was returning home from an event I attended. This one was in a much worse shape than the guy I talked about earlier, although he must have been 15 years younger. He was very dirty, he smelled, his hair was tangled and had a few braids. His clothes were also dirty and torn in a few places. He was thin and was carrying a plastic bag where he collected whatever interesting stuff he could find underneath the seats of the car. He had a lot of missing teeth and was cross-eyed. He didn’t seem to have any shred of normality left, but I soon learned that it’s not a good idea not to judge a person by appearances. Passing me by as I was sitting down, I extended my hand with some money in it, which he took without offering me any feedback, aside from a short and empty visual contact. He continued his operation of gathering stuff – without holding to a pattern, from pieces of paper to food packaging or anything else that was drawing his attention – until a subway security guy stopped him, signaling him to get off at the next stop. Obedient and without putting up a fight, the homeless man stopped his activities and placed himself in front of a door across from where I was sitting, with his back turned to me and waiting for the train to stop. He pulled the money I gave him from his pocket, looked at them and, as if he knew where I was, partially turned to me and nodded his head, without too much visual contact, repeating the gesture twice more. Although others could have deemed the gesture clumsy and inconclusive, then and there I understood that he thanked me, and I felt a tremendous feeling of satisfaction. Somewhere within him there was a shred of humanity left, I saw it clearly, and was the same as the gesture of the homeless man I met today in the bus stop. In both instances I experienced a feeling of fulfillment and that I’ve done the right thing. Maybe what I gave them wasn’t much, but from a spiritual connection point of view it was huge. Each homeless person has a story to tell. Some say it verbally, some with their eyes, others with their soul. Listen to their story, whichever form it might take, and in it you will find yourself. Your real self. Ce inseamna un cersetor sau un om al strazii pentru tine? Poate ca uneori inseamna un profitor, alteori un om parasit de noroc, cateodata nu inseamna nimic si treci pe langa el ca si pe langa orice alt element de fundal. Am avut multe intalniri cu oameni ai strazii, de toate tipurile. Nu dau bani tuturor, ci doar celor carora intuitia (sau instinctul, daca vreti) imi spune ca au nevoie. Si in special celor care nu cer. Azi asteptam in statie un autobuz spre centrul orasului (de ceva timp a inceput sa-mi placa din ce in ce mai mult sa merg cu autobuzul si metroul, si folosesc masina doar pentru drumurile mai lungi) si am observat langa mine, stand pe o bordura din fata unei farmacii – un om al strazii. Doar statea, nu cersea. Desi era murdar, cu parul neingrijit, nebarbierit si cu haine vechi si ponosite – parea demn. Avea in jur de 40 ani dupa aspect, 85-90 kg, inalt, si nu avea cu el decat o sticla de suc de portocale ieftin, la 2 litri, din care bause un sfert. L-am observat cam 5 minute din lateral. Parea un om normal, dar trecut prin multe, iar ridurile de pe fruntea lui aveau probabil multe povesti de spus. La un moment dat am vrut sa ma asez langa el si sa stau de vorba cu el, dar ceva m-a oprit. In plus, a inceput sa vorbeasca cu el insusi si sa gesticuleze – dar silentios, parand a nu vrea sa deranjeze pe cei din jur. Am deschis portofelul, am luat cativa lei si i-am dat. S-a uitat la mine cu ochii mari si a dat din cap, in semn de multumire, si imediat s-a ridicat si a plecat, avand parca o misiune. Probabil se indrepta spre un magazin sa cumpere ceva. Pe masura ce se indeparta l-am vazut intorcandu-se partial in directia mea, fara sa se uite direct la mine, dand din cap din nou, parca multumindu-mi inca o data. Acest ultim gest mi-a dat un sentiment placut, si mi-a adus aminte de un alt om al strazii pe care l-am intalnit intr-o noapte in metrou, cand ma intorceam de la un eveniment. Era intr-o stare mult mai proasta decat cel de mai sus, desi era mai tanar cu 15 ani. Era foarte murdar, mirosea urat, si avea parul incalcit si cateva codite impletite. Hainele erau si ele murdare, rupte, era slab si tinea in mana stanga un sac de plastic in care aduna ce gasea pe sub scaunele din tren. Avea multi dinti lipsa si ochii incrucisati. Nu parea ca ar mai avea vreo urma de normalitate, dar aveam sa vad mai tarziu ca aparentele inseala. Trecand pe langa mine, eu asezat pe un scaun, i-am intins niste bani, pe care i-a luat neschitand mare lucru, in afara de un scurt contact vizual in care n-am citit nimic. Si-a continuat operatiunea de adunare a diferitelor resturi – fara un tipar anume, de la bucati de hartie pana la ambalaje si orice altceva ii atragea atentia – pana cand un paznic din tren s-a pus in fata lui si l-a oprit, facandu-i semn sa coboare la prima statie. Ascultator, omul strazii si-a oprit operatiunea de cautare si s-a asezat in fata unei usi care era fata in fata cu scaunul meu, stand cu spatele la mine si asteptand ca trenul sa se opreasca. A scos banii de la mine din buzunar, s-a uitat la ei si, parca stiind unde sunt, s-a intors partial spre mine si a dat din cap, fara prea mult contact vizual, repetand gestul de inca doua ori. Desi altcineva ar fi putut zice ca gestul a fost stangaci si neconcludent, am inteles in acel moment ca mi-a multumit, si am simtit o satisfactie extraordinara. Mai ramasese o farama de omenie undeva acolo, am vazut-o clar, si la fel s-a intamplat si cu primul om al strazii pe care l-am intalnit azi in statia de autobuz. In ambele cazuri am simtit un sentiment profund de implinire si ca am facut ce trebuie. Poate ca ce le-am dat eu nu a fost mare lucru, dar din punctul de vedere al conexiunii spirituale a fost enorm. Fiecare om al strazii are o poveste de spus. Unii o spun cu gura, altii cu ochii, altii cu sufletul. Asculta povestea, sub oricare din formele ei, si te vei revedea si regasi pe tine, cel real.